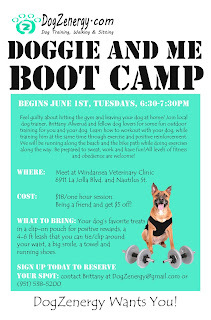 Doggie and Me Boot Camp! Drop down on all four paws and give me fifty! Introducing DogZenergy's Doggie and Me Boot Camp! After years of feeling guilty for going to the gym and leaving my dog Daisy at home, I realized that dog owners need a workout that they can do that will give them a challenge and exercise their dog all at the same time. I attended a human boot camp and asked if I could bring Daisy to the workouts. The trainer, Ray Wetterlund (best trainer in LJ!) agreed to let me try it out with her. Daisy loved it! I ended up getting my booty kicked and Daisy loved all of the action. Dog training in motion is much more effective because dogs love to be on the move. While I was doing crunches and pushups, Daisy had to be in a down/stay. As we were doing lunges and crab walks, Daisy had to do loose leash walking. Daisy most enjoyed the part where we had to jog and pass a tennis ball back and forth! The boot camp was not only tough, but really, really fun for both me and Daisy. We were more bonded after our workouts together and the best part was that we were both completely exhausted, balanced and zen. DogZenergy has now designed a workout and training regime for both dog and human. It combines fitness with physical and mental training, as well as team work and clear communication with body language. For most dogs, behavioral problems are the result of not enough exercise. It's important to get dogs on the move and do training at the same time so that the energy is released and the mind can be opened to learning new positive behaviors. Exercise also increases human and canine natural endorphins, which makes for a happy, zen dog and human combo! By releasing all of the stress and tension, it allows for a much more enjoyable and successful training session. So be prepared to sweat, power walk and get down and dirty! We will be starting at Windansea Veterinary and then power walking a mile long circuit from the vet, to the bike path and around down by beautiful Windansea beach. Along the way we will be doing a combined human and canine exercise circuit. Expect to do some push ups, sit ups, lunges, squats- you name it! All the while we will be training our dogs to do down/stays, sit/stays, watch me, loose leash walking and impulse control exercises. It's perfect for excitable pups and dogs with lots of energy that need to learn how to control themselves around other dogs and people. It's a great socialization experience in a controlled setting and it will teach your dog to walk nicely with other dogs. Don't worry if your dog doesn't know how to do the above mentioned commands, because we will be covering all of the basics and building on already learned behaviors. It's all about having fun and getting all of the energy out of our dogs while getting a good workout in for ourselves! Please join us every Tuesday evening at 6:30 in the parking lot of Windansea Veterinary. Bring sneakers, water for you and your dog, and a towel. Don't forget your smile, a clip on treat pouch with delicious treats and a six foot leash that can be tied around your waist. Contact me, Brittany for more info and to sign up at (951) 538-5200 or dogzenergy@gmail.com. Can't wait to see you there!